THE time is now to put aside political differences and drive a North Wales Growth Bid that will benefit future generations. A cross-party approach to economic development has been welcomed by MPs and Assembly members in the region, who are fully behind the Bid aiming to secure more than £1billion of investment for programmes that will improve infrastructure in areas including digital connectivity, transport, skills, adventure tourism, and land and property for commercial use and housing. Representatives of Labour, the Conservative Party and Plaid Cymru came together with members of the North Wales Economic Ambition Board in June to discuss key projects and priorities that could form part of a Growth Deal later this year. Over the summer they and the Ambition Board have lobbied businesses, government and the public, displaying a collaborative approach welcomed in Cardiff and London. Wrexham’s Labour MP Ian Lucas believes the Bid will be far stronger as a result, and said: “We have shown by coming together there is huge support for the North Wales Growth Bid. “Cohesion across all of the parties in this region will help strengthen that vision. Mr Lucas added: “For me, the top priorities are digital connectivity, transport and skills, they are areas that would benefit everyone for many years to come. “In north east Wales we’ve been choked by the success we’ve had in industry, so when it comes to transport and access getting rid of pinch-points – particularly in the road network – is key. David Jones, Clwyd West MP and former Conservative Secretary of State for Wales, was in agreement. “This must be regarded as a North Wales Growth Bid that delivers lasting benefits for the whole region,” he said. “Among the key priorities is transport; we must see significant improvements in our rail and road networks for businesses to compete. 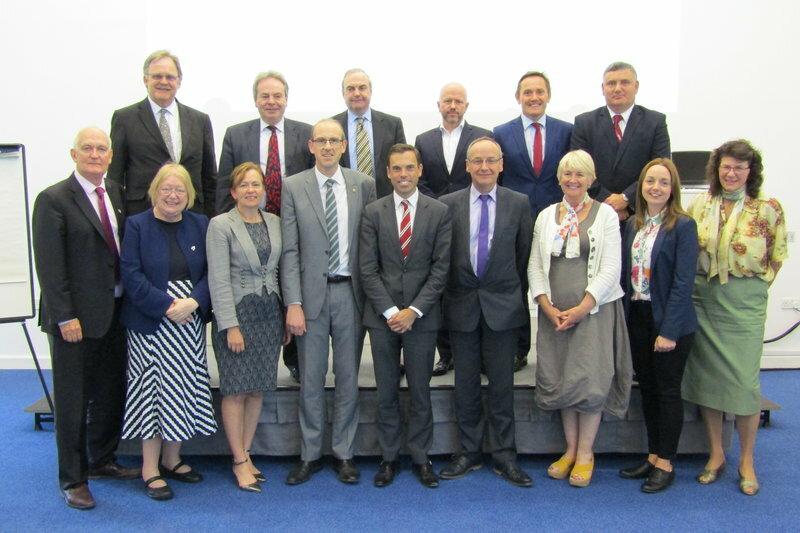 Chaired by Llyr Gruffydd AM, the inaugural cross-party meeting was held at the OpTIC Centre in St Asaph and included council leaders, MPs, AMs, the WLGA and representatives from the private sector and further and higher education. Ken Skates AM, Cabinet Secretary for Economy and Transport, was also in attendance, as was Plaid Cymru MP for Dwyfor Meirionnydd, Liz Saville-Roberts. She said that as autumn fast approaches the need for unity over the proposed Growth Bid is more crucial than ever. “It’s vitally important that the voice of the six local authorities in North Wales is heard loud and clear in these important discussions,” said Mrs Saville-Roberts. To find out more and register your support for the Bid, visit www.northwaleseab.co.uk or follow the hashtags #cefnogircais and #backthebid on social media.